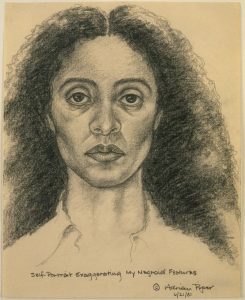 Brewery Art Walk is October 13 & 14, 11 am.-6 p.m.
Ojai Artists Studio Tour is Oct. 13, 14, 15, 10 a.m. -5 p.m.
Thursday, Oct. 25: Walk-through of Adrian Piper: Concepts and Institutions exhibit at UCLA Hammer Museum. Meet in front of bookstore at 1:30 p.m. sharp! A compelling exhibition at Suzanne Vielmetter Projects inspired by troubling events is exquisitely presented. Silence is Gold is the work of Iraqi-born artist Hayv Karhaman. 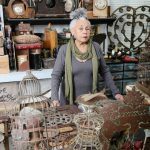 The work is inspired her experiences as a child as part of the exodus of Kurds from Iraq in April 1991. 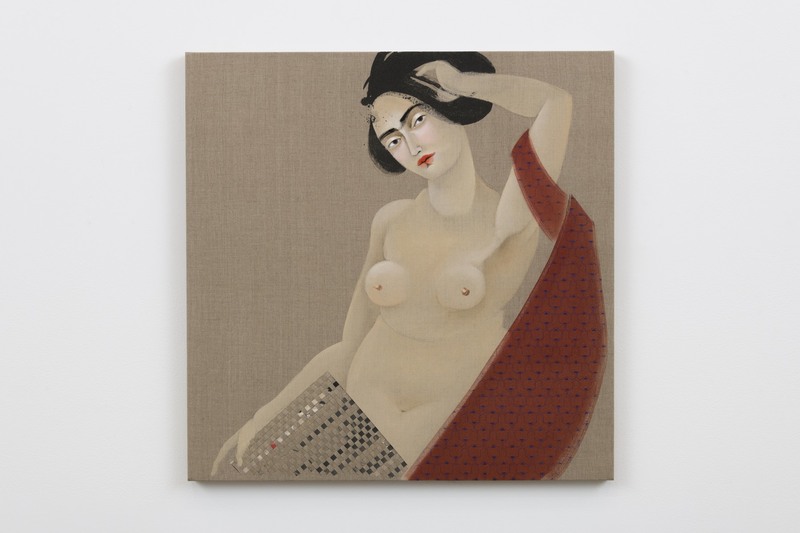 In the series of exquisite textured gold paintings, for example, exploited women look directly at the audience, unabashedly, unashamedly, spreading their legs or exposing their breasts, while refusing to lower their gaze. The paintings force the audience to look them directly in the face and see what was (and is) asked of these women: to let them be the objects of desire. The paintings play with gold as both color and texture. The rough textures, cut-up fabrics and multi-layering show that nothing is pure, simple or one-dimensional, despite the purity and innocence we ask for from the women who are being saved. The pure white is overlaid with the impurities of gold-leaf paint, creating a palimpsest that not only connects these paintings to each other, but to the history of such images, and to previous spectacles of suffering. Thru 10/27/18. Nancy Youdelman: Fashioning a Feminist Vision 1972-2017 will be opening later this month at the Cal State Northridge Art Gallery. The exhibition illustrates the development of Youdelman’s practice during the past five decades. Her work is most closely aligned with feminist art of the 1970s as she studied with Judy Chicago. She was one of the early feminist art practitioners. Her mixed media pieces are exquisitely crafted. 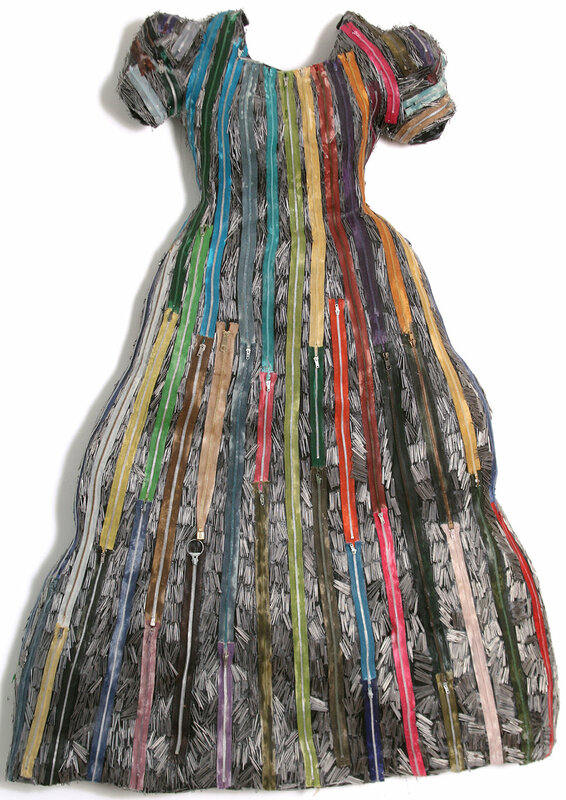 For example she takes second hand garments and shoes and encrusts them with a variety of found objects, resulting in meaningful mixed-media creations. Buttons, dried flowers, costume jewelry, broken pieces of glass and anonymous vintage photos figure prominently in her later works. 10/27-12/08/18. Opening Reception: Sat. 10/27, 4-6 p.m.
Panel Discussion moderated by Dr. Betty Ann Brown: Sat. 11/13, 2-4 p.m.
Rachel Hobreigh’s work will be featured in an exhibition at Red Hen Press in Pasadena. Other Realms is a two-person show with Hobreigh in collaboration with Marcus Maria Jung. The exhibition features painting, mixed media, sculpture and photography and invites the audience into an experience that is both, vibrant and meditative as it guides viewers deeper into the realms of nature. Hobreigh is internationally known for her works that situate the feminine in nature. 10/10-12/02/18 (by appointment). 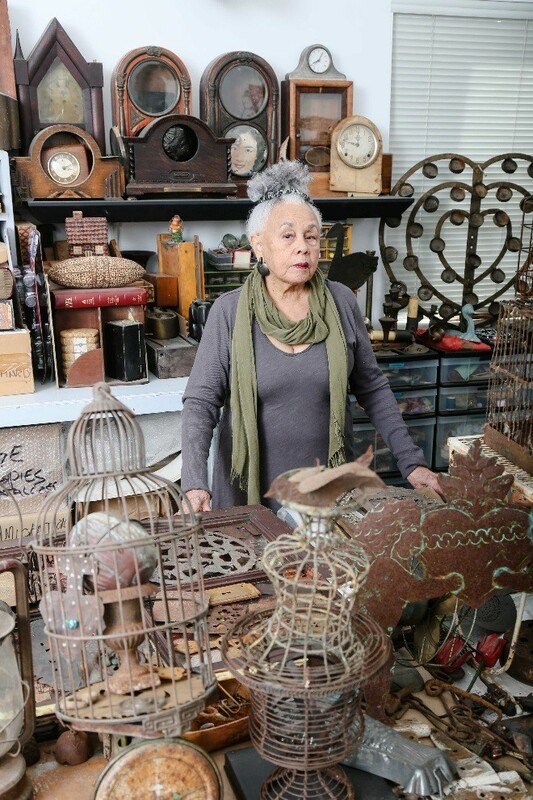 Opening Reception: Sunday, 10/14/18, 3-6 pm; Artist talk at 4 p.m.
Wilding Cran Gallery presents Muddy Water, an exhibition of sculptures by Karon Davis. The title comes from Bessie Smith’s 1927 recording of Muddy Water, a song about the Great Mississippi Flood. This body of work reflects on the effects of climate change, and subsequent migration and displacement, offering a glimpse into the experiences people encounter during natural disasters. Davis continues to work with full scale plaster-cast figures. Intentionally their armatures remain visible, juxtaposing the inner strength of the sculptures against their fragile exteriors; she likens the process to ‘reassembling broken souls’. 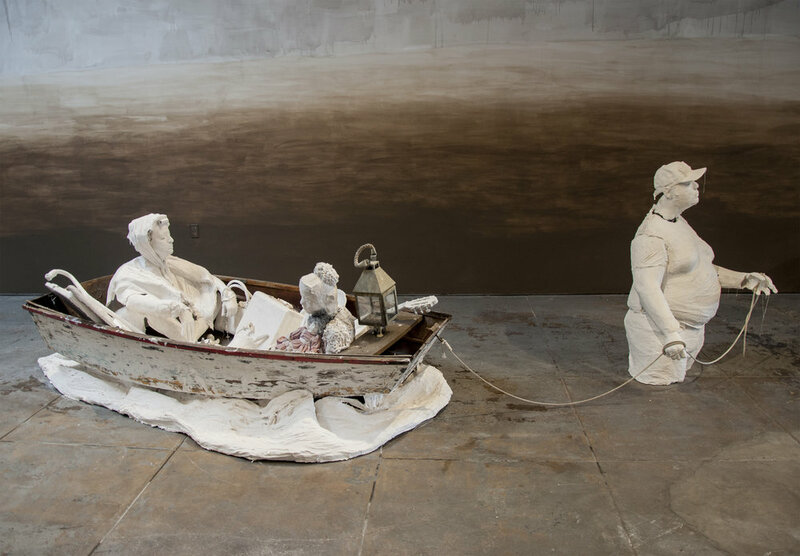 Some of the figures are inspired by images Davis discovered while reading news coverage of the recent events of flooding across our country in 2017, while others are imagined from personal experience of evacuating her home during the 2017 Thomas Fire. Woven into the exhibition as a whole is the sense of immediacy, crisis and loss, which is drawn from having to abandon cherished property in the blink of an eye. Thru 11/04/18. 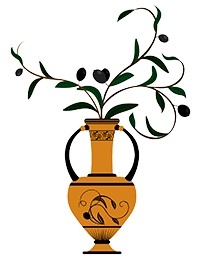 Rose Gallery presents Callis: Now and Then. These color photos by Jo Ann Callis were created in the late 1970s, yet not printed until recently and have never been seen before. These images which in some cases resemble forensic examples are completely staged. “They are evocative pictorial stories have been “fabricated to be photographed,” to use the now-established camera term the artist helped to pioneer, in order to dig up truths.” Thru 11/24/18. The Hung Liu exhibition, Crossroads continues at Walter Maciel Gallery. Her newest paintings are based on the Dustbowl and Depression era photographs of American documentary photographer Dorothea Lange, whom Liu has long admired. Also on view are Liu’s My Secret Freedom series. These small format landscape paintings were painted in secret while on location in the outskirts of Beijing from 1972-1978. Thru 10/27/18. Displacement, new work by painter and sculptor Arminée Chahbazian and Soaring, Stumbling, Surrending, a body of work by Yvette Brown continue at Lois Lambert Gallery. Thru 11/03/18. I stopped by the Getty Center yesterday to catch the exhibit Artists and Their Books/Books and their Artists. It was not what I expected at all. 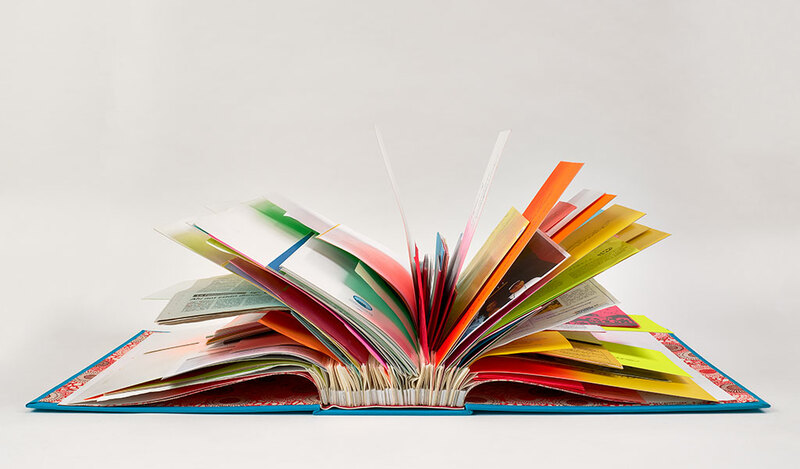 The definition of an artist’s book may need clarification. 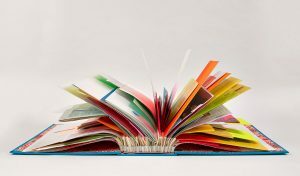 They are situated between traditional works and contemporary works of art, and definitely challenge what a book can be. This selection culled from Research Institute’s collections focuses on “books” that can be unpacked, unfolded, unfurled, or disassembled. Many are displayed on the wall or are sculptures and installation pieces. “The exhibition seeks to provoke new inquiry into the nature of art and to highlight the essential role that books play in contemporary culture.” Among the women artists whose books are part of the exhibit are Andrea Bowers, Lisa Anne Auerbach, Barbara Fahrner, Jennifer A. González, Katherine Ng, Barbara T. Smith, Cecilia Vicuña, Katharina Grosse and others. Thru 10/28/18. 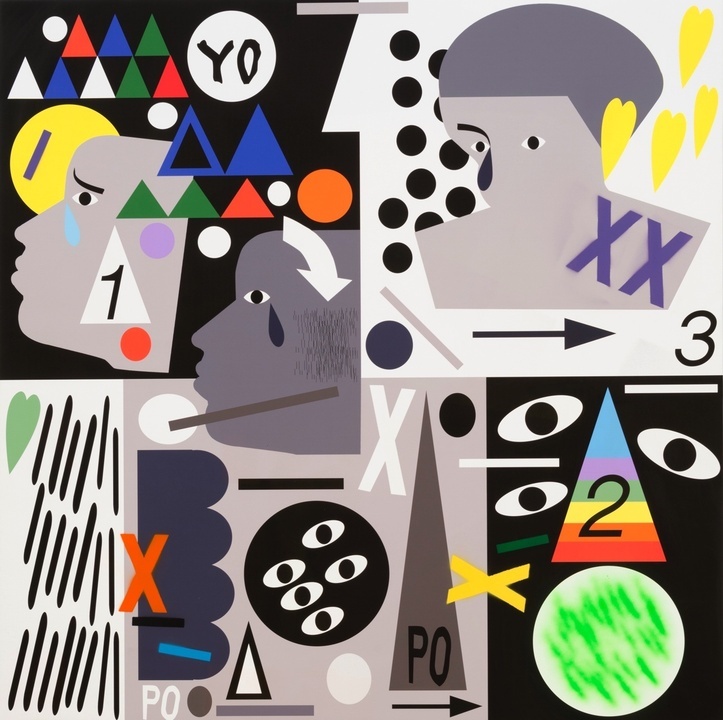 Royal Flush is the concurrent exhibition at the California African Art Museum and ICA (Institute of Contemporary Art, L.A.), a survey of art by Nina Chanel Abney. Abney is at the forefront of a generation of artists that is revitalizing narrative figurative painting. In her paintings, watercolors, and collages, imagery is influenced by mainstream news media, animated cartoons, video games, hip-hop culture, celebrity websites, and tabloid magazines. By engaging loaded topics and controversial issues with irreverence, humor, and lampooning satire, Abney’s works are both pointed contemporary genre scenes as well as scathing commentaries on social attitudes and inequities. She is a skillful storyteller providing interpretations of contemporary urban culture. The Craft and Folk Art Museum presents Unnatural Disastersis, a series of multi-layered paintings that explore the destruction caused by present-day environmental crises and the lasting impact of these events by local artist Merion Estes. Also at CAFAM is Sherin Guirguis: Of Thorns and Love. Guirguis presents her research of Egyptian feminist poet, activist, and writer Doria Shafik (1908 –75). For this exhibition, Guirguis presents paper-cut paintings, sculptures, and a site-specific adobe structure that make visible Shafik’s place in history, collective memory, and in contemporary feminism. Thru 1/06/19. Zoe Leonard and Laura Owens at MOCA 11/11/19. Sally Mann at Getty Museum opens 11/18/19.